Formulation: Liquid. In 50mM TRIS-HCl, pH 8.0, containing 1.0mM EDTA, and 5.0mM DTT. Application Notes: Biliverdin Reductase Activity assay (positive). Western blot control. Scientific Background: Biliverdin reductase (BVR), Heme oxygenase (HO) and UDP-glucuronosyltransferases (UGTs) form the major erythrocytic heme catabolic pathway in humans and most mammalian species. BVR is an oxireductase which catalyzes the reduction of the gamma-meso bridge of biliverdin to bilirubin. Data shows BVR as a phosphoprotein, and establishes phosphorylation as essential to the activity of BVR to reduce biliverdin to bilirubin. These studies also found that the enzyme is autophosphorylated and that phosphorylation is reversible. In mammals, bilirubin acts as either a neurotoxin or an antioxidant depending on its ratio to protein and concentration, possesses immunomodulatory properties, induces Arylhydrocarbon receptor-mediated activation of cytochrome P450 1a1 expression, and inhibits protein phosphorylation. BVR is unique among all enzymes characterized to date because BVR has dual pH/dual cofactor requirements. The reductase is highly conserved in its primary structure and molecular properties, using NADH in the acidic range (peak activity at pH~6.7), whereas NADPH is utilized in the basic range (peak activity at pH ~8.7). A single copy gene encodes BVR, and expression of the ~1.6kb BVR message occurs abundantly in kidney, spleen, liver and brain, as well as at lower levels in the thymus and minimal levels in testis. The human BVR was found to resolves into four isoelectric zones and two molecular mass forms (40.7kDa and 39.6kDa) in the liver, whereas researchers detected variants in the kidney. Biliverdin Reductase Activity: 1µg of Biliverdin Reductase Active Recombinant Protein was incubated with biliverdin in the presence of NADPH at pH 8.5, 37C. 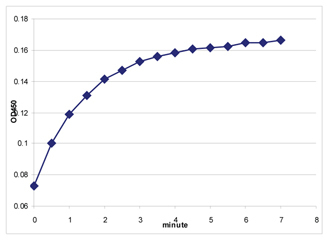 Product formation was monitored with a spectrometer at 450 nm. Western Blot Analysis: Lane 1: MWM, Lane 2: Biliverdin Reductase Active Recombinant protein probed with Biliverdin Reductase pAb (Prod. No. ADI-OSA-400). SDS-PAGE analysis: Lane 1: MWM, Lane 2: 0.5µg, Lane 3: 1.0µg, Lane 4: 2.0µg, Lane 5: 5.0µg of Biliverdin Reductase Active Recombinant Protein.